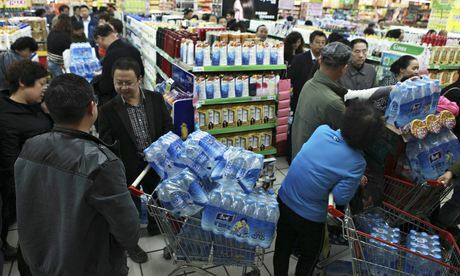 China's western city of Lanzhou saw a rush for supermarket bottled wateron Friday after authorities said the city's drinking water contained levels of benzene, a cancer-inducing chemical, at 20 times above national safety levels. With Beijing having identified the environment as one of its top priorities after years of unfettered economic growth, the government has struggled to make local governments and industries comply with laws. Lanzhou, a heavily-industrialised city of 3.6 million people in Gansu province, ranks among China's most polluted cities. The government found 200 micrograms of benzene per litre of water, it said, triggering the rush to stock up on bottled water. The national safety standard is 10 micrograms per litre. Water supply was turned off in one city district, and the government warned citizens not to drink the city's water for the next 24 hours. "Lanzhou has shut down the contaminated water supply pipe and deployed activated carbon to absorb the benzene," the government said in a statement. Activated carbon has small pores that enable it to absorb chemicals. Preliminary inspection showed the benzene came from nearby chemical factories, the local government said on its website, although no culprit was named. The environmental bureau is carrying out further investigations. The water supply company is majority-owned by the local city government, with British firm Veolia Water, a unit of French firm Veolia Environnement, holding a 45% stake.